Warren G. Harding campaign ad. The Ward County independent. (Minot, Ward County, N.D.), 28 Oct. 1920. Chronicling America: Historic American Newspapers. Lib. of Congress. This campaign ad says the United States is the biggest business in the world. Do you think that statement is true today? Why or why not? 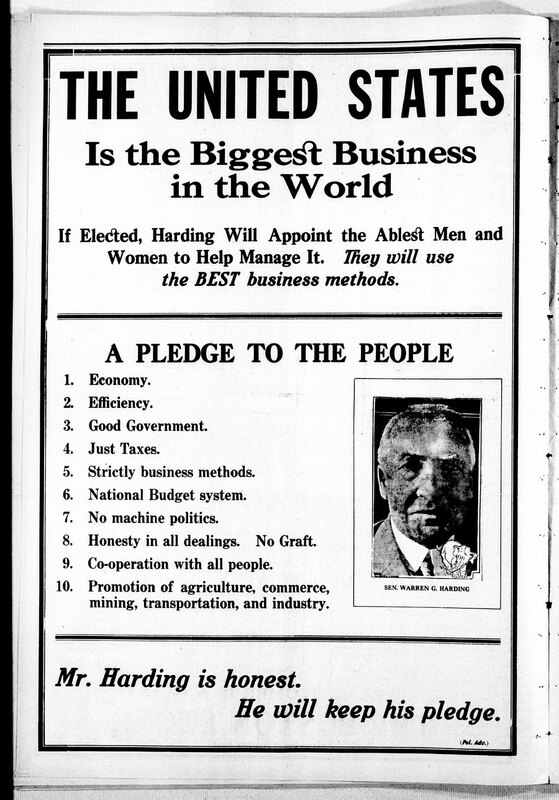 This campaign ad lists 10 pledges Senator Warren G. Harding promises to uphold. Which 3 do you think are most important for a politician to keep? Explain the reasoning for your choices. What pledges would you make if you were running for political office? Explain the reasoning for your choices.